Rest in eternal peace, Lincoln Valentine Scott – you'll never be forgotten! 2014 is over. The year took its leave with a shocking death toll on the world of music. Hopeton Lewis, Jimmy Ruffin, Uziah 'Sticky' Thompson, Pete Seeger, Bunny Rugs, Paco de Lucía, Tommy Ramone, Joe Cocker, Bobby Womack, Udo Jürgens and John Holt are some of the international musicians who are now rocking the stage of the hereafter. Tragic as these losses are, all of them have passed away naturally, more or less. So much the worse if a talented artist is ripped from life by a dastard murderer, thus done on October 9th in Manchester Parish, Jamaica. The victim of this senseless killing: Lincoln Valentine Scott (58), better known to most as Style Scott. Zapping through the texts and images the web has to offer on him (which are relatively few compared to the tremendous influence he has had on Reggae), he emerges as an outspoken, benevolent and life-affirming man, a person I would have liked to meet. A personal encounter made impossible now, it's a good thing that we will forever be able to acquaint ourselves with his music. 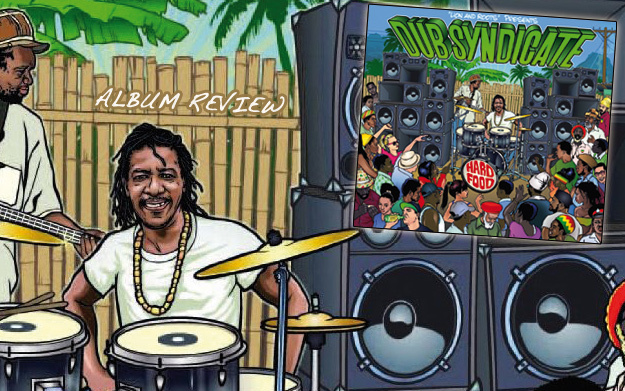 Leaving the immense output of the famous Roots Radics and other collaborations aside, Mr. Scott has published fourteen albums since he joined forces with Adrian Sherwood to create Dub Syndicate in 1982, the last one (No Bed Of Roses) in 2004. Different projects and touring kept him busy, so that we didn't hear much from the British duo for the next decade. Around 6 years ago, however, Style had an inspiration and in early 2014, a message spread that work on a new album had started. The project proceeded quickly, and on May 26th it was announced that Hard Food was almost ready, only some dubs left to do. And now, exactly 3 months after his violent death, his last baby is seeing the light of day as an orphan. It is presented by Style's own imprint, Lion & Roots, but the actual house of release is the Hanseatic dub-specialist Echo Beach. Recorded in Jamaica at Inna De Yard Studios and Mixing Lab/ Harry J's (one of the last interviews with Style Scott was conducted there after a recording session), the material was sent to On-U Sound and received its finishing touches by producer Sherwood and engineer Dave McEwen. From the initial selection of the songs over their prudent arrangement to the wonderful cover-artwork by Rok Ogorevc, great care has been taken to create a lasting impact. Seven of the 14 tracks included have been written by the drummer, and of course he himself played all the drums and percussions. Other masters of their trades create a unique, warm sound: Flabba Holt on bass, Dalton Brownie and Robin Patrick Key on guitar as well as Computer Paul and Obeah on piano and organ. Additional instrumentalists such as Dave Fullwood (trumpet) on a haunting Love Addis Ababa, Ivan 'Celloman' Hussey on an experimental Gypsy Magic and Marc 'Dubiterian' Brehmer (melodica) on the Firehouse Special embellish these tunes and make voices dispensable. In fact, only five voices are heard at all on the album, and while some of them (Bunny Wailer on Bless My Soul, U-Roy on Dub Is All I Got or Bermudan singer Magma on Love Is Coming At You) get quite prominent stretches, Lee Scratch Perry and Sangie are dub-typically shredded apart in Jah Wise. Even though the laid-back sound of dub is clearly dominating the release, all tracks radiate a positivity that will leave you smiling, especially the playful A Food Thing and Brain Food. Every tune contains little sonic surprises, and even after the third round of intense listening I still discover bits and pieces that have escaped my attention before. The aforementioned dubs Love Is Coming, Police In Helicopter and Rock With You Baby are closing the album, and I can't help but go for round number four. With Hard Food, Style Scott unwittingly created his own legacy, because this is the album he will be remembered for: an outburst of creativity and talent that he planted and nurtured, but tragically hasn't seen blooming into completion. Rest in eternal peace, Lincoln Valentine Scott – you'll never be forgotten!